As Arvind Kejriwal’s campaign in Delhi surges ahead, it is hard to miss the desperation and panic that has taken hold of the Bharatiya Janata Party and its national leadership. The party’s local leaders – many of whom resent the manner in which the high command imposed Kiran Bedi as their Chief Ministerial candidate – may have reconciled themselves to defeat, or at best a slender victory margin, but Narendra Modi and Amit Shah, who realize the stakes involved, are making every effort to stop the Aam Aadmi Party from winning. So far, however, their ‘3M strategy’ of throwing Modi, Money and Mud into the fray has not had the desired effect. Despite the crores spent on saturation advertising, the campaign rallies addressed by the PM and his ‘hawala at midnight’ allegation against AAP, Kejriwal’s party is comfortably ahead in virtually all opinion polls. How did the BJP’s script go so terribly wrong? After all, it won the largest number of seats in Delhi December 2013 and all seven Lok Sabha seats last May. Given the prestige and popularity enjoyed by Modi, this election was meant to be a cakewalk. Especially since the AAP had the handicap of Kejriwal’s ill-advised decision to resign from the Chief Minister’s post after 49 days in office, which coloured the public’s perception of the party and its ability to govern. If the BJP finds itself fighting with its back to the wall, it has only itself to blame. The first mistake Modi and Shah made was to delay the holding of assembly elections. Even though it was clear that a government could not be formed without engineering defections from the AAP and Congress, the BJP used its influence over the Lieutenant Governor to string out the process. What the BJP hoped to gain is not clear, but the delay clearly helped the AAP re-establish itself as a fighting force. Fuelled by its victories in Haryana, Maharashtra and Jharkhand, the BJP then made its second mistake: to avoid declaring a strong Chief Ministerial candidate and rely instead on the ‘Modi wave’ to see it through. Though this strategy did not work so well in Maharashtra, where the party failed to win a majority, or Jharkhand, where an expensive alliance with the All-Jharkhand Students Union was needed, the Haryana result emboldened the BJP to play the Modi card to the hilt in Delhi. Where earlier the party had a strong and credible de facto CM candidate like Harsh Vardhan, voters this time around were encouraged to back a faceless campaign and trust in the magic of the ‘Modi sarkar’. When this strategy came a cropper – the very first rally addressed by Modi turned out to be a flop – the BJP brass changed tack and decided to project a credible local face to counter the appeal of Kejriwal. 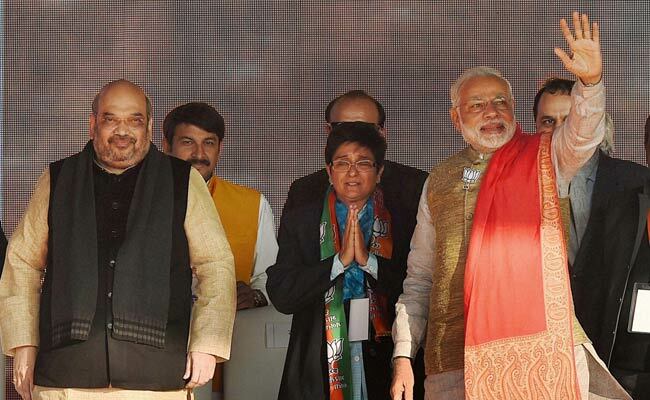 The selection of Kiran Bedi seemed at first to be a masterstroke. But as the former police officer hit the election trail, it became apparent that her attractiveness did not extend beyond the party’s traditional middle class vote bank. Indeed, the goofiness of some of her pronouncements has alienated even middle class supporters, while her imperiousness has rubbed party cadres and local leaders the wrong way. The BJP has tried to correct this third mistake by committing a fourth – getting Modi and senior party leaders to make personalized attacks on Kejriwal and to accuse the Aam Aadmi Party of money laundering and hawala. The allegations might have had credibility if the BJP did not itself take more than 60 per cent of its declared contributions in cash without providing any details about the donors. In the absence of any attempt by the Enforcement Directorate, the Income Tax authorities or the Directorate of Revenue Intelligence to probe the shell companies that are supposed to have donated Rs. 2 crore to the AAP last April, many in Delhi will likely treat the allegations as a desperate smear campaign. The Modi card may also now be facing diminishing returns, as voters tire of seeing the Prime Minister’s face at every street corner and in every newspaper, and of hearing his voice on the radio. The election in Delhi is significant because it represents a pure political contest between the BJP and a rival that is strong and not discredited by corruption, or hobbled by anti-incumbency. If the BJP loses, the result will provide proof of concept for a model of politics that could also emerge elsewhere in India. Modi has so far remained unvanquished, winning every election battle he has led since 2002. Losing Indraprastha will destroy the aura of invincibility that has stood him so well for 12 years. Even if Modi manages to win Delhi for the BJP, the fact that he had to fight so hard ought to make him stop and think about what he is doing wrong. The campaign by the Sangh Parivar against a family-oriented film with a strong positive message like PK, or the communal statements of Sangh activists and leaders, is not something that attracts young voters with aspirations for a better life. Yet the Prime Minister has kept quiet, reinforcing the belief that he backs their divisive agenda. His failure to actually do things on the ground for the poor has also reinforced the perception that the BJP is a party of the rich and elite. If Modi does not fix these two problems quickly, his political ride is likely to be uphill from here on. The answer is likely to be nothing more than simple arithmetic. The Congress is decimated, and all of their traditional votes have gone overwhelmingly to the AAP. Since the BJP never had a voter majority its own anyway, this helps the AAP. Ironically, the death of the Congress has spelt disaster for the BJP. This entry was posted on February 5, 2015 by Siddharth Varadarajan in Indian Politics.